Study for Threshold - Plan, North [blue with orange on blue] #2, 2016, Gouache on paper, 15.25 x 22 inches, paper, 16.75 x 23.5 inches, framed. Study for Threshold - Plan, SouthEast - Two [orange with blue] #2, 2017, Gouache on paper, 23 x 22 inches, paper, 25.125 x 23.875 x 1.5 inches, framed. 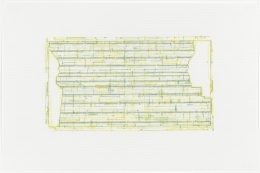 Trace 3 : after Threshold SouthEast One [ spectrum: yellow ], 2010 / 13, Gouache on UV paper, 11.5 x 17.5 inches, paper, 12 x 18 inches, framed. 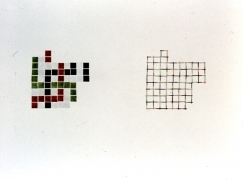 Study for Entry Borders and Corners #1, 1999, Gouache on paper, 22.5 x 30 inches. MMW scalino profile: NorthEast-two, 2007, Gouache and flasche on Fabriano paper, 10 x 23 inches, paper, 12 x 25 inches, framed. 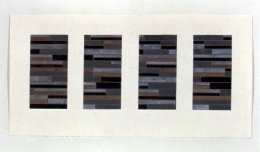 Study for South Wall, Bricks and Siding, 1996, Gouache on paper, 15 x 30 inches, paper, 17.5 x 32.5 inches, framed. 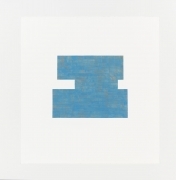 Study for Threshold - Plan, North [ blue with orange ] #2, 2017, Gouache on paper, 23 x 22 inches, paper, 25.125 x 23.875 x 1.5 inches, framed. Living Rooms NorthWest - Two, with lights, action, 2003-05, Oil on canvas, 32.25 x 24 inches. Lumine IV: asunder [twilight], 2017, Oil on canvas, 23 x 27 inches. Study for Threshold - Plan, NorthWest - One [violet with yellow] #1, 2016, Gouache on paper, 14 x 12 inches. Inclusively and theoretically, Julia Fish’s (b. Toledo, 1950) work can be characterized as both site-generated and context-specific: in temporary projects / installations, and in the on-going sequence of paintings and works on paper developed in response to a close examination of the experience of living and working within her home and studio, a 1922 two-story brick storefront in Chicago. Fish has described this process as one which “opens onto questions and critical approaches to the practice of painting, to drawing, and to the nuances and implications of representation / re-presentation.” Concurrent and influential research interests include the related disciplines of architecture, architectural history and theory. 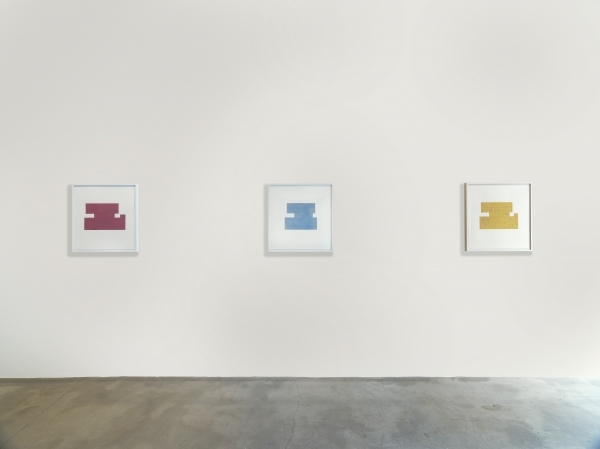 Julia Fish’s work has been presented in twenty-six solo exhibitions since 1980, and was the subject of a ten-year survey exhibition, View, at The Renaissance Society, University of Chicago. 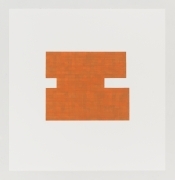 National/ international exhibitions include, among others: San Francisco Museum of Modern Art; MAK Center for Art and Architecture / Schindler House, Los Angeles; Tang Museum, Skidmore College; Martin Gropius Bau, Berlin; Galerie Remise, Bludenz, Austria; 2010, the Whitney Biennial, and Homebodies, MCA Chicago, 2013. A selected survey of Fish’s work of the current decade is scheduled for the DePaul Art Museum, Chicago, 2019. 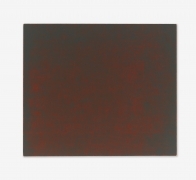 Her work is included in the permanent collections of the Art Institute of Chicago; Museum of Contemporary Art, Chicago; Los Angeles Museum of Contemporary Art; The Museum of Modern Art, New York; Denver Art Museum; Yale University Art Gallery; The Smart Museum of Art, University of Chicago; University of Michigan Museum of Art; and Illinois State Museum, Springfield. Julia Fish’s studio work and research has been supported by grants and fellowships awarded by the Louis Comfort Tiffany Foundation; National Endowment for the Arts/Painting; Richard H. Driehaus Foundation; Cal Arts-Alpert/Ucross Foundation. 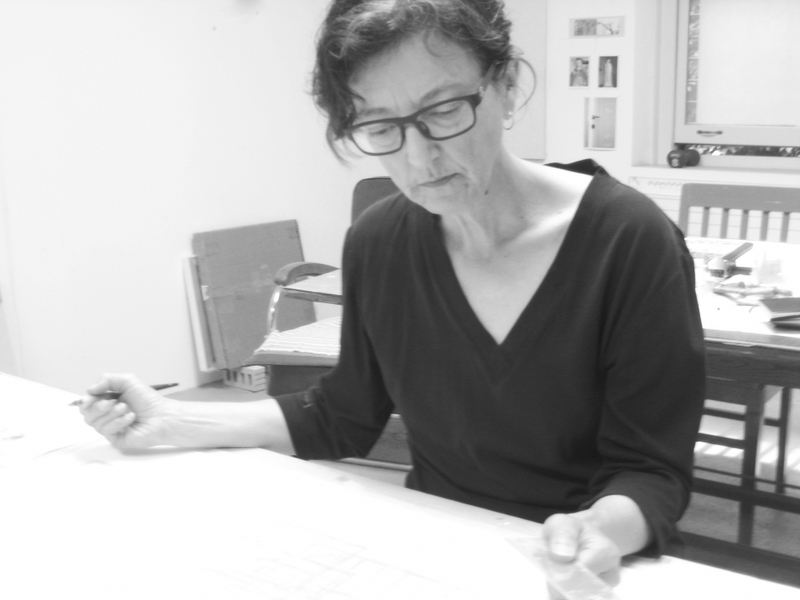 Julia Fish is Professor Emerita, School of Art and Art History, and UIC Distinguished Professor.